I'm working with eye movements since 2004, when together with prof. Ober I proposed the idea of identifying people using their eye movements characteristics. I had a break in 2008-2012 when I was a Dean of Computer Science Faculty in Siesian Higher School of Computer Science but since 2012 I am back on track! 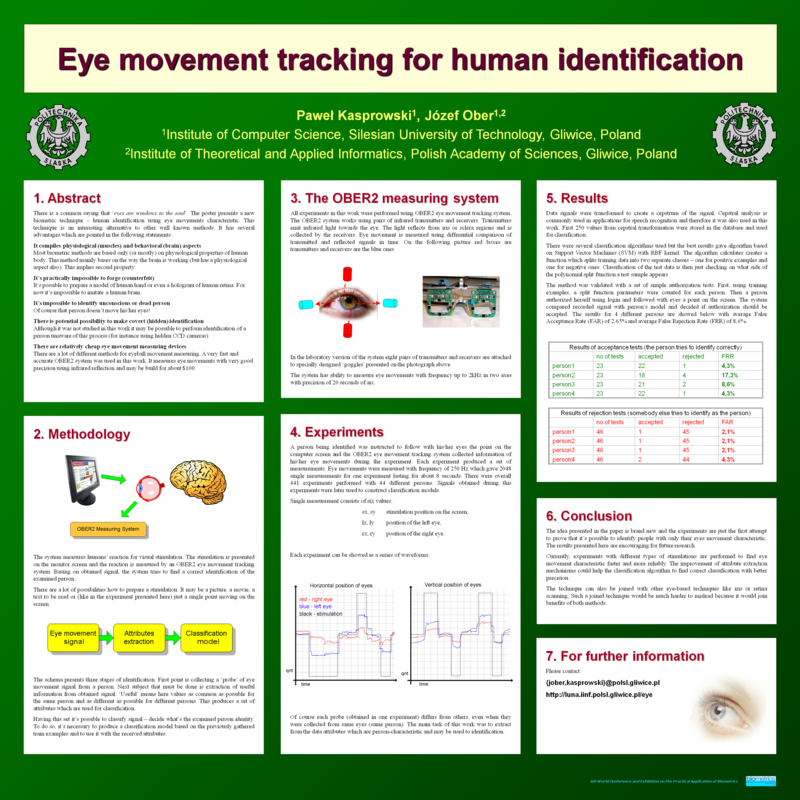 The idea that eye movement characteristics may reveal the person's identity was presented for the first time in London during the VII World Conference and Exhibition on Practical Application of Biometrics BIOMETRICS'2003 on the poster entitled [Eye movement tracking for human identification]. The poster achieved the Best Poster on Technological Advancement prize. The original idea was descibed in 2004 in the paper [Eye Movements in Biometrics]. In 2005 it was further extended in [Enhancing eye-movement-based biometric identification method by using voting classifiers]. You may also be interested in my PHD: [Human identification using eye movements] but please cite the papers instead :)! For some general information about the issue you can also look at my presentation performed during Biometrics 2012 Conference in London entitled Eye Movements Biometrics - Where you look shows who you are. 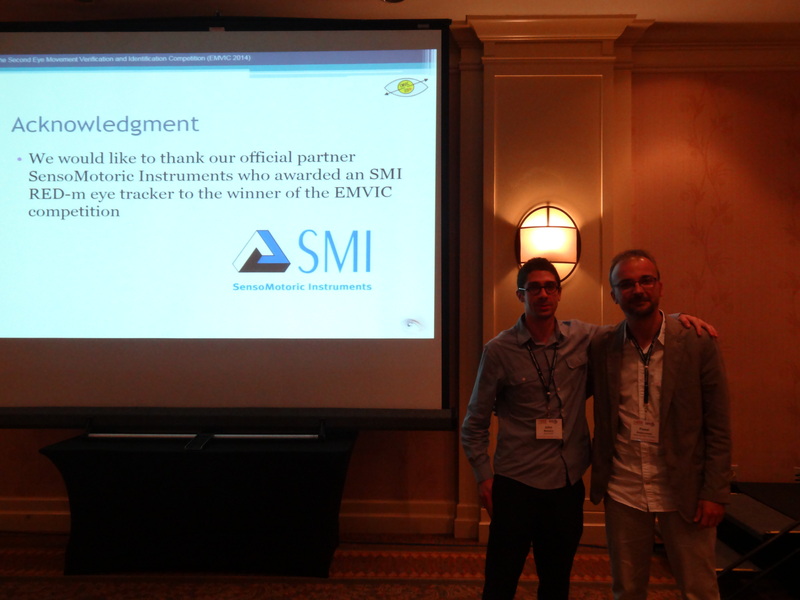 In 2012, together with Oleg Komogortsev from Texas State University, I organized The First Eye Movement Verification and Identification Competition (EMVIC 2012). 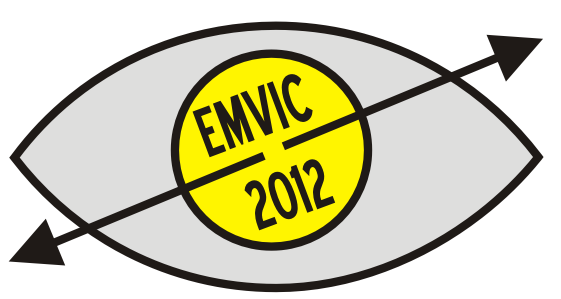 Details of the competition may be found in the paper: [First Eye Movement Verification and Identification Competition at BTAS 2012] and on the competition's web page. There were four datasets published and participants uploaded their results through competition's web page and kaggle.com. Preparation of datasets for this competitions was a great opportunity to learn what should be avoided when preparing data for behavioral biometrics experiments. Our experience shows that it is very important to maintain a proper time interval between subsequent samples of the same subject. It occurred that the samples taken in very short intervals (e.g. 10 minutes) tend to be artificially similar - probably due to similar mood or mental and physical state of the person. Therefore, recognition results are - artificially - better. See our general paper about behavioral biometrics [The influence of dataset quality on the results of behavioral biometric experiments] or the more specific paper about eye movement biometrics [The Impact of Temporal Proximity between Samples on Eye Movement Biometric Identification] for details. In 2016 we published a paper in which we used a fusion of two modalities: mouse dynamics and eye movement to correctly identify people. The paper entitled [Fusion of eye movement and mouse dynamics for reliable behavioral biometrics] was published in Pattern Analysis and Applications journal. All these problems were discussed in our publications. In [Guidelines for eye tracker calibration using points of regard] we checked various ways to build the calibration function. This function is in fact a regression function that maps eye positions to PORs. We tried 3 different functions: polynomial, ANN and SVR. In [Idiosyncratic repeatability of calibration errors during eye tracker calibration] we checked if calibration results are repeatable for participants i.e. if the same participant has similar error in subsequent calibrations. It occurred that it is true, but only to some extent. As the classic calibration with points of regard are a bit unnatural for users, we also tried alterative scenarios. In the paper [Study on Participant-controlled Eye Tracker Calibration Procedure] we proposed calibration scenario that involves interaction with users. The users had to click points of regard and observe an arrow displayed on the screen. The experimental part showed that calibration results for this scenario are better than for the classic one, but the main drawback is that it lasts longer. We still search for the ways to omit the calibration at all. In the paper [Implicit Calibration Using Predicted Gaze Targets] presented during ETRA 2016 we proposed an algorithm that automatically calibrates eye movement signal using probable gaze locations during normal users activities. It seems that it would be easy to use gaze pointing as a replacement for other traditional human computer interaction modalities like e.g. mouse or trackball, especially when there are more and more affordable eye trackers available. However, it occurs that gaze contingent interfaces are often experienced as difficult and tedious by users. There are multiple reasons of these difficulties. First of all eye tracking requires prior calibration, which is unnatural for users. Secondly, gaze continent interfaces suffer from a so called Midas Touch problem, because it is difficult to detect a moment when a user wants to click a button or any other object on a screen. Eye pointing is also not as precise and accurate as e.g. mouse pointing. In the paper [Eye Movement Tracking as a New Promising Modality for Human Computer Interaction] we addressed these problems and presented the results of an experiment that compares three modalities: mouse, touchpad and gaze in a simple shooting game. In the paper [Cheap and easy PIN entering using eye gaze] we studied possibilities to use eye tracking for PIN entering (e.g. in ATM). The main drawback of the presented method was necessity to calibrate every user prior to PIN entering. Therefore, in the paper [Using Non-Calibrated Eye Movement Data To Enhance Human Computer Interfaces] we checked if uncalibrated data may be used to enter simple information and it occurred that it is possible. During our research we focused on helping children with various disabilities. For now we published two papers about it. The first one [Application of Eye Tracking to Support Children's Vision Enhancing Exercises] shows that it is possible to make vision enhancing exercises fun for children with the usage of an eye tracker that is able to change boring exercises to interesting and interactive games. Additionally, together with Robert Koprowski and Marek Rzendkowski we created a new type of automated, computerized perimeter designed to test the visual field in children and adults. The device was described in the paper entitled [Simplified automatic method for measuring the visual field using the perimeter ZERK 1]. The Big Data problem influences eye tracking as well. We heve more and more eye tracking data to analyze and its proper storage becomes a challenging task. We adressed this problem in our two publications. In [The Eye Movement Data Storage - Checking the Possibilities] we checked efficiency of various possible data storages in the context of eye movement storing and querying. In [Disk Space and Load Time Requirements for Eye Movement Biometric Databases] we focused on eye movement databases for biometric identification purposes. 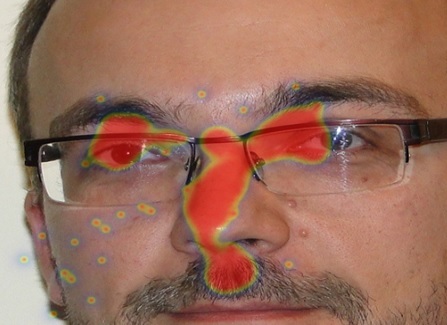 We constantly try to explore new applications of eye tracking. In the paper [The Eye Tracking Methods in User Interfaces Assessment] we analyzed how eye tracking may be used to evaluate user interfaces and proposed some guidelines. In the paper [Mining of Eye Movement Data to Discover People Intentions] we tried to guess if a person was lying by analyzing the person's eye movement.